Son of whiskynose praises Toon's Cockney Colossus. | NUFC Blog. Son of whiskynose praises Toon’s Cockney Colossus. 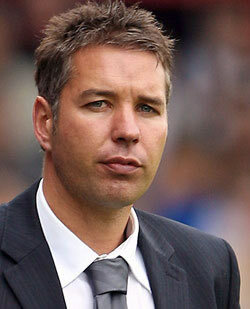 Speaking in his post match interview after after Newcastle United’s 3-1 triumph over Peterborough, Posh manager, Darren Ferguson, gave fulsome praise to Newcastle United, and unpopular London manager, Chris Hughton. He even went as far as saying that his Peterborough United team played the club who WILL win the Championship on Saturday. “You have seen the team that will win the league. The manner of losing the first two goals was awful. We left ourselves a mountain to climb. They are on a roll at the moment. Ferguson, like Hughton himself, has been the subject of some criticism recently. Despite performing miracles with a squad built on a tiny budget, and defying the odds to gain promotion in the playoffs last season, Ferguson’s Peterborough are currently lying bottom of the Championship with 11 points and only two wins this time ’round. He has also been linked with potential moves to larger clubs such as Reading and Hull City. Hughton happy with squad and just window shopping in the January Sales? Chris H. might not be everyone’s ideal choice to be Newcastle’s long-term manager, but I would hardly describe him as unpopular. He is to be admired for the job he has done in terrribly difficult circumstances. Ole red wine nose was not a happy chappy, this afternoon, having lost precious points to Chelsea. Good game to watch, with Rooney and Carvalho both having outstanding games. Guess we will give all three a run for their money next season, following the takeover and spending spree, about to take place. What sort of headline is that? WHAT A FCUKING DISGRACE MR COWELL! T_F agree 100% batty and his bro should have been kicked out along time ago, so aswell as batty sleeping with Stardust he is obviously sleeping with Simon Cowell aswell the wee slapper. Simon really knows his music! FERGUSON IS AN IDIOT EVRYBODY KNOSE THAT HUTON WILL NEVER BE A REEL MANAGER HES JUST ASHLYS PUPPETT COZ NOBODY ELSE WOULD GIVE HIM A JOB ANYWER!!!! HE IS JUST TAKING THE CREDIT FOR WHAT SHERER DID LAST YEAR!!! You mean getting relegated, PG? Oh yeah! QC! They used to have the nerve to call that muck ‘Sherry’ until they were banned. You n’ Stardy lost then, batty? He’s not hated, also you might want to look up the word “irony”. Steve, he really has performed a miracle there considering the funds he’s had at his disposal. I hope the Posh fans have more sense than our lot and don’t turn against him because Peterborough are bottom. He’s got the most he can out of the team he has and needs a bit more cash now at this level. Surely that was sarcasm Alan? You can’t possibly be serious there! We’re always shouting for managers to be sacked like big kids who are sick of their toy at Christmas, it’s what we do. My jaw dropped a little when I read that too, nufcbb. Top form to-night WORKEY ! Like the terse but to the point replies. very entertaining ! Hughton has done a brilliant job, and maybe, just maybe, he could actually blossom into a cracking manager. He needs a chance and some time. The only things which will hinder him are the pricks in charge of the club. We’re looking good at the moment, hopefully we can keep it up. I don’t think I’ve heard one person imply they didn’t like Hughton. So I don’t think he’s unpopular. I just think the nature of his appointment was a little protracted and unnecessary. That in itself made the appointment unpopular, rather than being about the man. Being apprehensive about the man’s abilities doesn’t mean you don’t have regard for him, particularly the insularity implications worky, not sure I agree with those mate. Though it was effective like you say….. The fact is BBM – he has galvanised the squad with a determination that has been missing ever since KKs walk out. The players, staff and CH deserve massive credit. Irrespective of your thoughts – because his surname isnt Keegan – he has done a fine job this season – and deserves a round of applause – even some of the games we drew or lost we were by far the better team. Err !what exactly is it you are trying to say, either you hate Hughton or you dont ? If you do hate him is it because of footballing decisions ? hmmm! First of all, I would hardly say he’s unpopular – he’s done brilliantly to get a club in a horrible downward spiral to leaders.